SUMMARY: I see an Alien in my bedroom. I appear to be in my bedroom with my bed up against the fire escape wall. I'm sitting up in bed, and talking to someone a foot away from me (on my right). 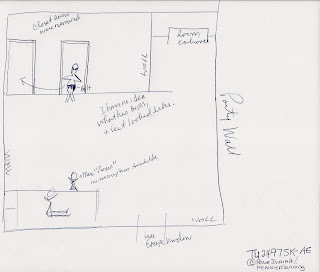 While I'm talking, I see a short alien across the room, walking towards the left past the closet wall then stop in front of the first closet on the right. I remember saying and/or thinking "Isn't he cute? He's so little." I ask whoever is beside me something about the alien, then the alien continues walking, approaching and entering the next closet. His legs did not appear to be very long. He definitely WAS NOT taller than two feet. He reminded me of a child—(like it was) one of their kids but very intelligent and self-sufficient. His movements were quick enough. Scurrying is a nice word. This alien seemed benign. I remember awakening briefly and thinking, "He was kinda cute." Most everything looks the way it does in waking state—the bed is exactly where it is in reality. The only difference is that where the alien is standing there should be furniture and clothing. And in waking state, I'm laying down on my back. I'm not certain where he came from, perhaps the right closet or entrance door.